It was my birthday last week (yay! ), and despite thinking that I couldn’t possibly need any more nail supplies my mother was awesome enough to get me striping tape, nail studs, brushes, and a variety of other fun things. So I had to try out my new toys! I used one of my all-time favorite colors, a bright minty green. I recently bought a few China Glaze polishes from Beyond Polish, which offers them at $3- $3.50! Highlight of my Summer was a must-have… it’s this amazing pastel neon mint green that I’m in love with! And who doesn’t love a sparky mint green like Orly Sparkling Garbage? So I knew I had to use both! To accentuate the gorgeous greens, I started off with a nice neutral color – Essie Chinchilly. I love this color, but the polish was very sheer & thin/ almost runny. It was extremely patchy on the first coat, but I was pleasantly surprised that the 2nd coat made it evenly opaque. This entry was posted in Nails and tagged china glaze, china glaze highlight of my summer, essie, essie chinchilly, manicure, nail art, nail polish, orly, orly sparkling garbage, striping tape on February 26, 2014 by doctorcrafty. I got nominated for the Shine On Award by the lovely Lucy from Makeup Crazy! Check her blog out – she’s really talented in putting classy makeup looks together. I knew from the age of 7 that I wanted to be a doctor. So I guess that makes me really stubborn, huh? As a junior in high school, I toured Europe for a month as a part of a concert band. It was made up of a select group of high school band students from across the east coast. I played the trumpet – I continued to play through college and I miss it! I also used to play the piano and I taught myself how to the play the flute… badly. I’m so not a sorority girl… but I was one. I went to college at a place where I didn’t know a single soul, so the Greek system was a good way to meet people and be a part of the social life. I am a Chi Omega alumnus, so I love anything involving owls or skull & crossbones! I truly think that if I met her, Jennifer Lawrence would be my best friend. I aspire one day to have someone respect my opinion enough to send me nail polish to review! I think I have impeccable taste in music, movies, & TV shows, but I have a lot of guilty pleasures too. For example, I love me some Bravo TV and crappy reality shows. On the night we met, the first things my husband and I bonded over were our shared love of Monty Python and The State. Before I share my nominations with you, I want to show you a few pics of a new polish. 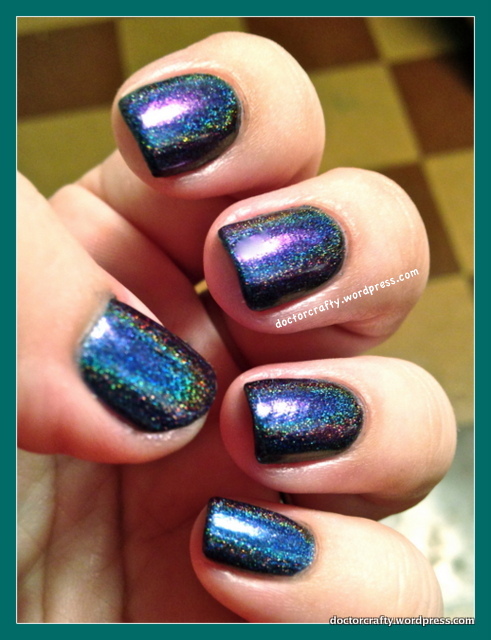 Colors by Llarowe puts out some amazing holos, and I bought a few of the multichrome holos. Right now, I have on Rockin’ My Juju, which is a ridiculously amazing color. 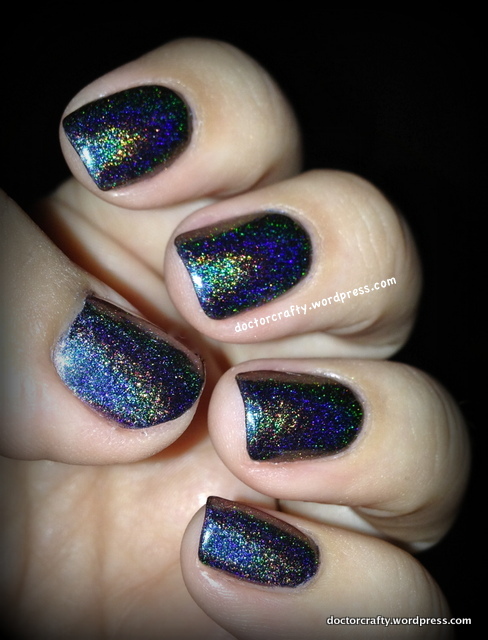 It shifts from blue to purple, but is predominantly teal-blue and has a really strong linear holo. You can easily wear it on its own since it’s opaque in 2 coats. I love it! You can see some of the purple shift in the above pic. But really, pictures don’t do this color justice! 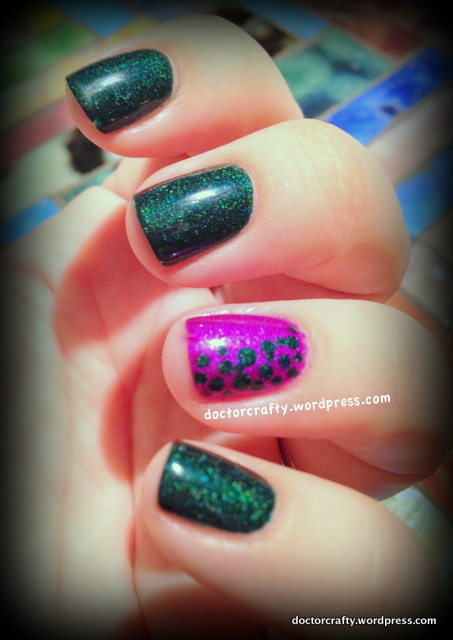 This entry was posted in Nails and tagged band geek, colors by llarowe, colors by llarowe rockin my juju, random facts, rockin' my juju, shine on award on February 21, 2014 by doctorcrafty. The Tin Man got a heart for Valentine’s Day! Happy belated Valentine’s Day everyone! I’m not the biggest fan of this “holiday” because of all the commercialism, but I do enjoy any reason to celebrate love! Plus my birthday is Monday, so I’d much rather celebrate my birthday than VDay. The husband and I used it as another good excuse for a fun date night – had some yummy seafood and then went to go see Frozen (super cute movie if you haven’t seen it!). And of course I had to have something VDay-related on my nails. I’ve been seeing a lot of cutout gradient designs, so I figured I’d try it with hearts! You see why I titled my post like that now? The silver reminds me of tinfoil… tinfoil, tin, tin man, hearts for the Tin Man! Free association people! This entry was posted in Nails and tagged essie, essie boom boom room, formula x, formula x pyrotechnic, gradient nails, hearts, illamasqua, illamasqua collide, manicure, nail art, nail polish, nails, orly, orly shine, valentine's day manicure on February 16, 2014 by doctorcrafty. Just a quick post to show you one of my new gorgeous Zoya polishes. Zoya had a promotion awhile back where you could get 3 polishes for just the cost of shipping. So I bought Dream, Payton, and Paloma. 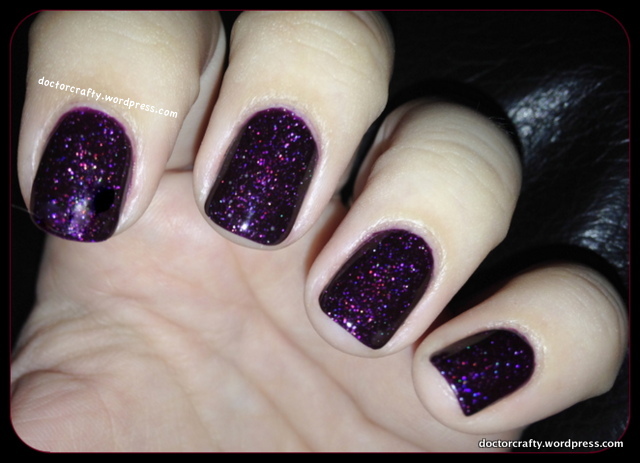 Payton is this beautiful dark cranberry red/ almost oxbood polish with scattered multicolor holographic specks. The holo layers really well and adds a nice depth to the color. I love this polish! I haven’t tried Dream yet, but from what I’ve seen on other people’s swatches and in the bottle, I think I’m gonna love it! 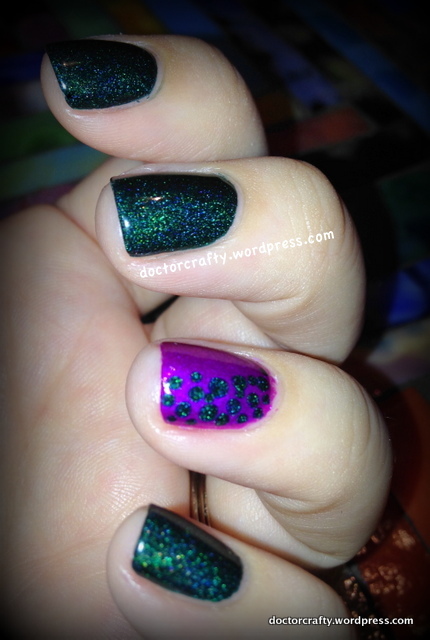 This entry was posted in Nails and tagged holographic, nail polish, nail polish swatch, nails, zoya, zoya payton on February 11, 2014 by doctorcrafty. 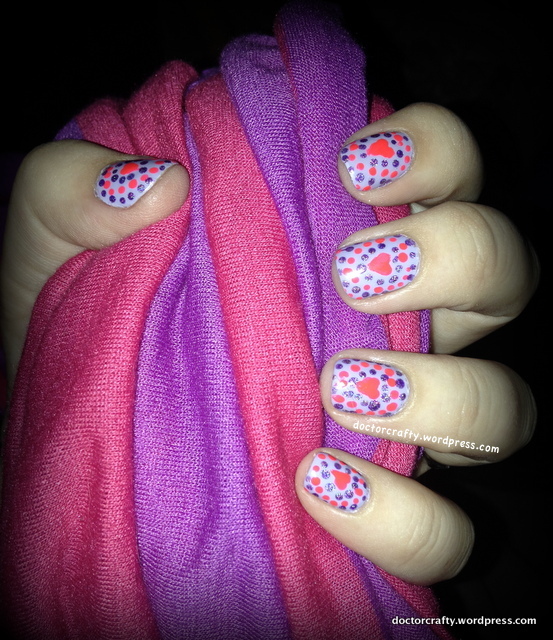 I’ve had the idea for this manicure for awhile – dotted outlines around a heart. I originally was planning on using purple and teal, but I came across an old beloved scarf that inspired the color combo. 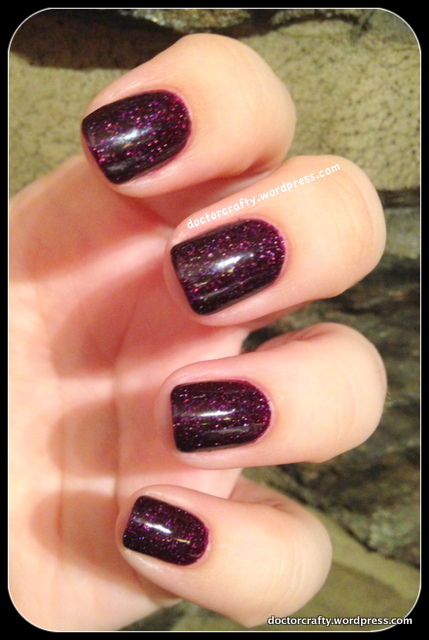 Purple and an electric reddish pink – so pretty! The scarf photographs more pink, but it does have more of a reddish tinge in real life. So that’s what I did! 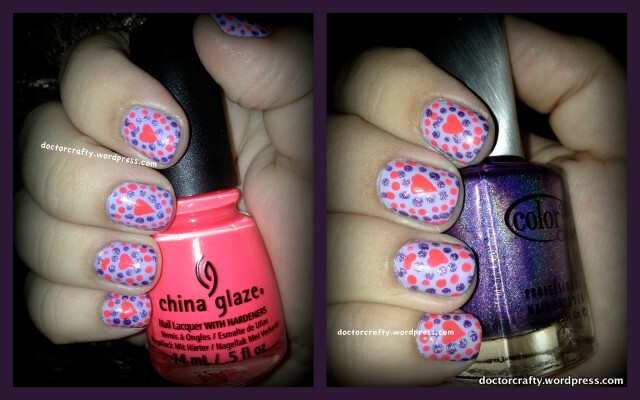 I used my dotting tool to make the center heart and a smaller tip for the rest of the dots. I actually think my right hand (pictured above) came out better than my left. Maybe because I was more deliberate while dotting my right hand, who knows? Anyways, I think the center hearts came out better on the right. I do, however, love my left middle finger. And that’s not just because it gets a lot of use in everyday gesturing lol! My dotting skills still need a bit of work, but I still think this came out lovely. Center heart and outlines: China Glaze Pool Party – a neon reddish pink, one of my favorites! 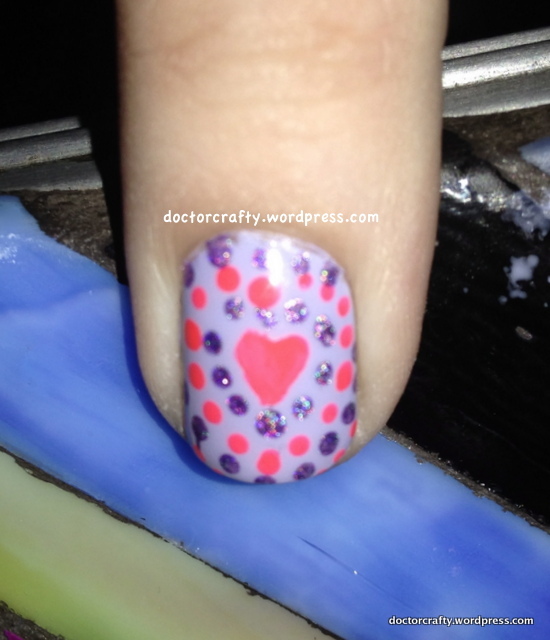 This entry was posted in Nails and tagged china glaze, china glaze pool party, color club, color club eternal beauty, dotticure, formula x, formula x heart-stopping, hearts, manicure, nail art, nail polish, nails, stamping decal, valentine's day on February 6, 2014 by doctorcrafty. I can’t keep my nails too long for work – they’ll rip through gloves and hurt the tiny humans I treat. And we can’t have that! So I chopped them off recently, and now my nails are sad little nubbins. What better way to make sad nubbins happy than to sparkle them up? I painted all but my ring finger with A England’s Saint George. It’s such a pretty scattered holographic emerald green. Love it! 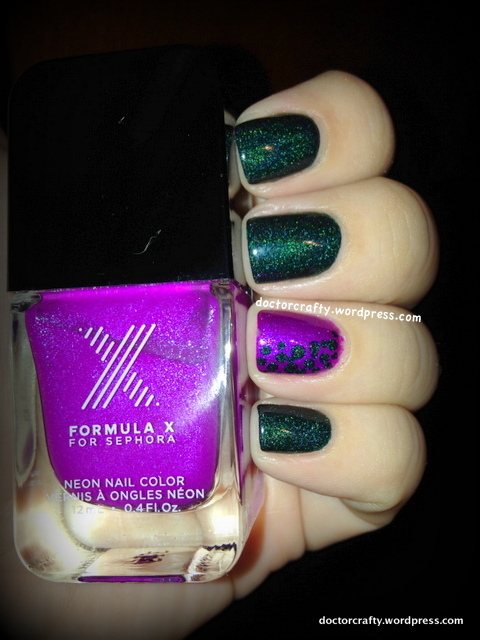 My ring finger is Formula X for Sephora’s Hyped. I love this polish too! It’s this shimmery electric purple that has blue micro-flakies. My pics don’t do it justice – it’s gorgeous! I also threw some dots of Saint George on that ring finger. I was rushing this part a bit because it was late at night and I was exhausted. So my dots could have been better, but I like the overall look a lot! I also recently joined Instagram & Facebook as Doctor Crafty, so if you feel so inclined please follow & like me there! I’ve linked those widgets to my page. 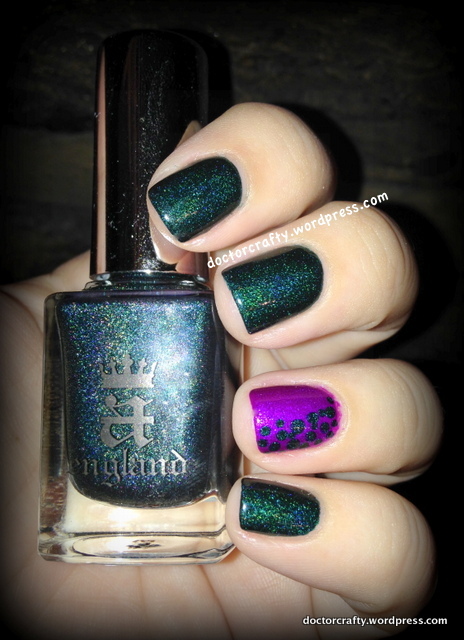 This entry was posted in Nails and tagged a england, a england saint george, dotticure, formula x, Formula X Hyped, manicure, nail art, nails on February 1, 2014 by doctorcrafty.